With demolition now complete on the Marriott Headquarters future site, the construction phase will begin in earnest through the coming weeks. You will likely notice an increase in activity in and around the site in the form of equipment and material deliveries, environmental and safety controls, excavation, hauling and drilling operations. 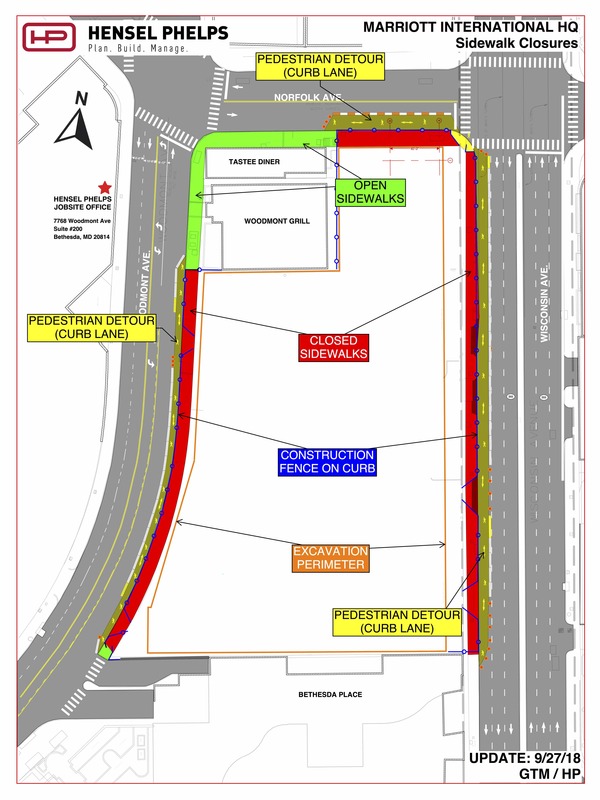 In preparing the site, which will encompass sidewalks along sections of Woodmont, Norfolk and Wisconsin Avenues, lane closures have been set-up through Montgomery County and State Highway to provide access for construction activities as well as safe pedestrian passage, outlined in the diagram below. Please pay close attention to newly posted signage and be alert for flaggers, as they are there for the safety of all of us. Throughout construction, you can be assured that we will do our very best to minimize impacts to this wonderful neighborhood and the people who frequent it. 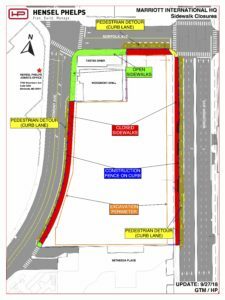 There are significant upgrades planned for the infrastructure in the roadways which will require lane closures and at times, pedestrian detours will need to be adjusted. With that being said, we ask for your patience during periods of inconvenience in knowing that good things will ultimately follow. We will do our best to provide the community ample notice of these occurrences and will again ask for your patience, as our safety and yours are our number one priority.